Our latest project, The Streetviews of San Francisco, was featured on ValleyWag by Sam Biddle, The Atlantic and Yahoo! News by Alexis Madrigal, The San Francisco Examiner by Jonah Owen Lamb, Fast Company by Ariel Schwartz, The Bold Italic by Jennifer Maerz, Tenderloin Blog, Nerdcore (Germany), Mission Local by Lydia Chavez, and by Paul Mison's Notes. 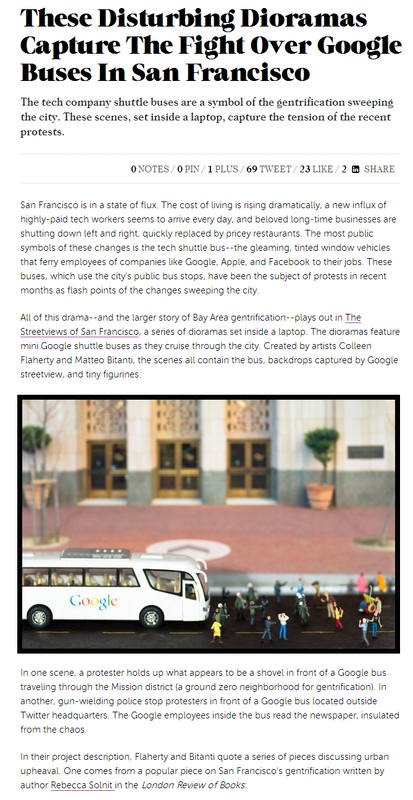 See also "Tech Rides Are Focus of Hostility in the Bay Area" by David Streifeld and Malia Wollanjan, publihed by The New York Times on January 31, 2014.